In a food processor fitted with an S blade, grind sunflower seeds for about 2 minutes or until fairly fine (I forgot to do this and it still turned out ok). Add tahini, raw almond butter, raisins/dates and raw honey/syrup, and blend for about 2 minutes or until a thick paste forms. Mixture will be relatively dry. Using your hands, roll small amounts of mixture between your palms to form small balls. 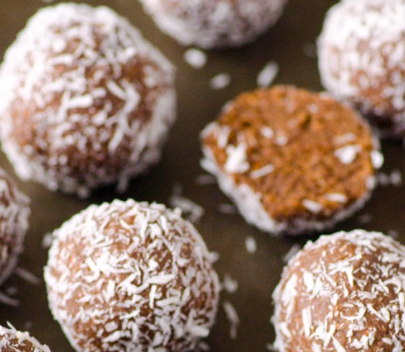 Roll balls in coconut flakes, if using. Place in a container with a tight-fitting lid and refrigerate or freeze for a chilly treat. These will last up to 2 weeks. This was a great recipe to make with my 3-year old son. He enjoyed helping me make them and eating them.